Carp Fishing Orellana. Extremadura. Spain. The Orellana is the jewel in the crown of Spanish Carp fishing, it is the natural home to huge shoals of wild Carp, probably the hardest fighting Carp you will ever encounter. This venue provides the serious Carp angler the unique opportunity of bagging wild monster fish that have probably never seen a hook before, it has already produced Carp to over 70lbs. There are undoubtedly many larger carp in this lake waiting to be caught. There are literally thousands of wild Carp in this lake that have never been caught, which gives this water an incredible atmosphere unlike any other you will fish, a must fish location for the serious Carp angler. Having researched, studied and fished this incredible location for over 14 years, our expert knowledge of this water will assist you in having a Carp Fishing experience you will not forget. Fishing the Orellana could never be easier, we provide all equipment and tackle* required to enable you to fish this prolific water. Due to the predator side of the business getting really busy, the months of being on the bank over the years and we arent getting any younger, we are offering this package. Dont worry you dont get abandonded, you will have tips and advice from a top class Guide, productive fishing areas in private fincas and out the way locations. Fishing the Orellana could never be easier with our NEW Fly and Survive Package. On arrival in Extremadura, one of our 4x4 vehicles or our 5 m Skiff will transport you to proven productive swims where you can settle in for the duration, relax and enjoy the superb fishing. Cooking facilities will be provided; groceries and food will be brought to you on the bank (depending on duration). A suitable 2.5 meter dingy equipped with fish finder will be provided for baiting up purposes, there’s even an ample amount of particle and quality boilies from VITAL BAITS thrown in. Accommodation in a local casa rural on your final night is included in the price, if required. Car hire is recommended for getting here, Malaga 3.5hrs, Madrid 3hrs or we can arrange transfers from Madrid in taxi shuttle for 75 euro return (restricted days-times). We will do your shopping for your arrival. Nash 3lb TC rods, bank sticks/pod, spod and marker rod, landing nets, unhooking mats, scales and weigh sling. A 2 man Bivvy each, Nash Bed-chair, Bivvy Table, coolboxes and catering equipment. Everything to make your session comfortable. * All necessary equipment except for end tackle, reels, swingers and alarms. An ample amount of top quality VITAL BAITS Boilies (3kg for 3 nights, 5 kg for 7 and 7kg for 10 nights). Ample prepared particle consisting of maize, maize pellet, wheat, halibut pellet, tiger nuts, habas beans and other goodies. 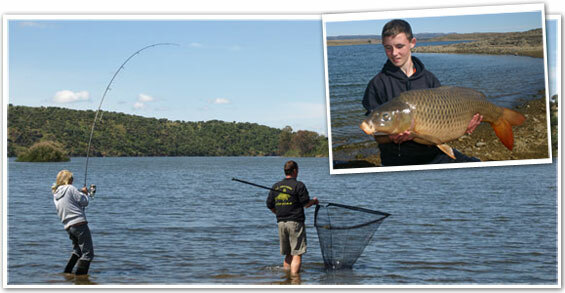 ** Orellana Specimen Carp Packages run from September through to end of May. All prices are in EUROS based on a minimum of 2 anglers and subject to availability. Craig 49 has been successfully involved in guided fishing on Spanish waters now for 15 years, originally on the River Ebro before relocating to Extremadura over 14 years ago. He has fished from a young age and pursued Specimen Carp and Barbel for over 35 Years.